152 mm/54 MK-3-1524 х 3 pcs. 37 mm 46-K8 х 4 pcs. 37 mm V-1110 х 2 pcs. Lenin — Soviet Tier VIII battleship. 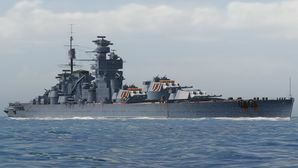 One of the variants of a high-speed battleship with a 406 mm battery (Project 21), developed under the "Big Fleet" program. A distinctive feature of the Project was the concentration of the main battery turrets in the ship's bow. This page was last modified on 2 April 2019, at 05:24.